And All That Hype, VR Companies, VR Publications, Where Are They Now? I wrote this for a 1991 Meckler conference presentation. Still smiling at my naivete! It’s tough trying to manage one of these businesses. Every time one of my vendors/bankers/landlord/ etc., asks what we do, and I say “Virtual Reality,” their eyes roll up and then glaze over, as if to say: “Oh God! One of those flakes!. ..and he seems so normal” At that moment I make a mental note to drop the words virtual reality from my spiel. Why do all the “suits” tune out as soon as they hear these two words? How did we get this bad rep? How do I extract myself from this morass? Twenty years ago this month, I published an article in the VR industy’s only magazine, Meckler’s Virtual Reality Report (12 pages including the covers – subscription: $197/yr.) Skeletons never stay buried forever; this one surfaced right on schedule a few days ago from the back of a dusty file cabinet. I had started a VR company, StrayLight, just 6 months before penning this bit of unsolicited business advice. I’m wearing a huge smile as I now share the enthusiasm and naivete of a much more youthful alter ego. Most contemporary VR implementations, literature, and thought derive from academic or research settings. More important, many of the so called “futurists” who propose to have visions of VR’s future come from outside conventional business environments. The two hot topics seem to be defining the semantics (shall we call it virtual! alternate/artificial reality, cyberspace, simulation, etc…?) and social engineering. These social engineers are essentially the folks who want to overthrow the existing social and political order in favor of one of their own design, and have now become entranced by the promise of VR. I guess if you can’t change the real world, building your own is the next best thing, but of course, you may not have many visitors. Anyway, the credit manager from the firm that sells us computers didn’t seem overly interested in semantics or social upheaval either; he had his own alternate reality and the means to coerce my participation in it. What did seem to impress him was our understanding of our customers and markets, and the reasons people would actually pay money for the stuff we make. Somehow I escaped without being branded a “flake” and, more important, with the line of credit we needed. I felt there was a lesson in this mundane encounter. If the VR gadgets we are working on are to have any meaning and impact on society, our company had to survive, and to do so we had to create things that people want badly enough to pay for, and pay enough to keep us from going belly up. The incentives are pretty compelling not to just create something that is “really neat” to us, but instead something in which our customers find value. Having anecdotally introduced my topic, we can now proceed onto a bit firmer ground by addressing the issues normally. The main theme of technological history, especially in free market economies, is that market and industry forces are the prime determinants of technological growth and application. Opportunity drives innovation, and opportunity in turn is driven by the needs of buyers who can and will pay for such innovation. While an exploration of the “defintional, spiritual, philosophical, sociological, and creative meanings of virtual reality” is laudable, its utility in forecasting the future state of VR is highly limited. VR entrepreneurs who find opportunity in this field will run roughshod over the conventional wisdom and morality of today’s philosophers. As a result these philosophers’ visions will, at best, playa peripheral role in the establishment of VR as a mainstream industry. Why does opportunity drive innovation? It’s basically a Darwinian thing; you don’t survive long inventing products that nobody wants. Conversely, there are many rewards for inventing things that lots of people want and can afford. Why do you think AutoDesk, Nynex, and EDS are engaging in VR research? But what about those “pure” research labs? Most are funded either directly or indirectly by companies that hope and pray there will be a market (albeit far in the future) for the fruits of their research, or by pubic or private institutions that serve the needs of some group of constituents who also hope to apply this research. The point here is that capitalism will have a far greater effect on VR than will political correctness, semantics, or social causes. It’s not a matter of advocating or rejecting capitalism, but rather acknowledging its pervasiveness and accepting it as a powerful force acting on YR. By coming to grips with capitalism we can better understand how VR will affect and change our world as it blossoms. Several analytical tools are useful in a market-driven approach to any budding industry: history, technological and market evolution, industry structure, and the value chain model. Each of these offers a different, yet interrelated perspective. First, let’s humbly admit that VR is not the first technology which threatens to forever change the world. The interrelationship of technological and social change has an extensive and well documented history. Movable type, the industrial revolution, radio, television, and medicine are but a few examples. Universally, the application of these technologies has been driven by the profit motive. Although their impact has been less than socially perfect, there appears to be no preferable process in sight. There are several interesting parallels in the development and establishment of earlier technology based industries. Such industries have followed similar developmental patterns from laboratory curiosities to specialized niche markets, and slowly entering markets with broader appeal as intensified competition and demand force production innovations which drive down costs and thus prices. Some have revolutionized societies while others have merely revolutionized existing industries. In either case the revolution came as a result of the market demanding new processes and products in favor of old ones, and was not due to the efforts of the technology’s early developers. Societies are changed by technological advances when groups perceive benefits in the appreciation of those technologies and forsake old social modes for new ones to adopt such technologies. The process of change is facilitated by firms which detect and exploit those preferences. Short of dismantling the world’s freemarket economies, this dynamic is unlikely to change. Less socially relevant innovations merely revolutionize industries. A free market tends to drive enterprise into efficient modes of operation. Firms which discover better ways of filling customer needs drive out firms which fail to innovate. While competitive markets may sometimes fail to be completely efficient, this failure is clearly the exception and not the rule. Innovation also occurs in nontechnical arenas. Such innovations are primarily in novel methods of distribution, that is, new ways of delivering goods or services to consumers. Consumer warehouses are not feats of technical genius, but rather a unique and successful way of delivering goods to retail markets. Fast food chains, portion size packaging, twenty-song music marathons, and movie channels are a few more examples of unique distribution systems. Consider similar possibilities for nontechnical innovation in VR. Industries also have structure. This is the interrelationship between various industry participants, suppliers to that industry, customers of the industry, regulatory forces, products from outside the industry, and the threat of new entrants into that industry. For instance, an industry may be weakened by having only one supplier of a key component. On the other hand, if there are very few buyers for a given industry’s products, those customers will undoubtedly get excellent pricing and service. Consider what happens to industries where one firm’s products are indistinguishable from another’s. Buyers simply choose the product with the lowest price. Airline tickets on highly competitive routes are an excellent example of this phenomenon. Barriers to entry are also important to a firm’s success or lack of success. Your company will be far more successful if potential competitors find it too costly to enter your business. There has been only one new entrant in the commercial aircraft business in recent memory, and it has taken Airbus almost twenty years and countless billions of dollars to break even. Nonetheless, it is important to realize that industry structures evolve over time and that innovation is an important force in these changes. Currently, VR is probably not mature enough to be considered as an industry and therefore has little, if any, real industry structure. However, it has considerable commercial promise in a number of existing industries and the application of VR threatens to revolutionize many of these. VR will likely follow the classic path of starting as a set of potential technologies which incrementally find commercial embodiment in established markets. As various elements of these technologies begin to see implementation, VR will invade and disrupt the structure of many existing industries. As VR further matures, it will take on a structure of its own, incorporating fragments of the industries it has shattered. Another important aspect of industries is the value chain. If one examines a final product and looks at the various steps and processes which add value to that product, the value chain becomes clear. A car starts with raw materials: steel, rubber, plastic, etc. Design engineering is added, then manufacturing processes, then shipping to the dealer, and finally sales and service are added. Take away any of these and the car is less valuable. Thus each process adds value to the final product. Look at each of the components of a car: the wiper blades, battery, engine oil, etc. ; each has its own individual value chain which is folded into the car’s overall value. Often the segments of a product’s value chain are divided amongst several firms. VR will also have a value chain. There will be firms which specialize in making VR computers, others that make interface hardware. There will be creative talent to design and implement the content of these realities. There will be software tool building houses and other companies dedicated to creating virtual reality clip art. There will be application specialists whose focus will not be virtual reality per se, but rather finding solutions to specialized application needs. They will embrace VR only when it solves the problems of their customers. VR will be interlinked with the structure of the teleconununications industry since virtual realities will undoubtedly be shared over long physical distances. The formative force for these value chains will be opportunity. How will VR evolve in the next ten years? There will be two related paths: those of enabling technologies spanning many applications and those of vertical market specialists. Vertical market specialists are close to complex customer needs. They are constantly scanning market and technological horizons to find better solutions to these needs. Enabling technologies are the gadgets which vertical market specialists find, integrate, and bring to customers. These specialists add value by applying technological elements to specific customer needs and by providing accessible and efficient distribution channels. Firms which focus on creating enabling technologies seek to build tools which will have broad application in a number of vertical markets. They do not seek to address specific customer needs, but rather desire to exploit a technology in as many markets as possible. In doing so, enabling technology firms concentrate their resources on perfecting the technologies and manufacturing processes, rather than investing in distribution and application-specific expertise. VR will play out along these lines. Initially a few firms will come up with innovative technologies. Some will desire to apply these technologies to several markets while others will be interested in narrow vertical markets. In either case, the value chain will be incomplete and therefore these firms will be forced to forward and backward integrate in order to complete the chain and provide integrated solutions to customers. 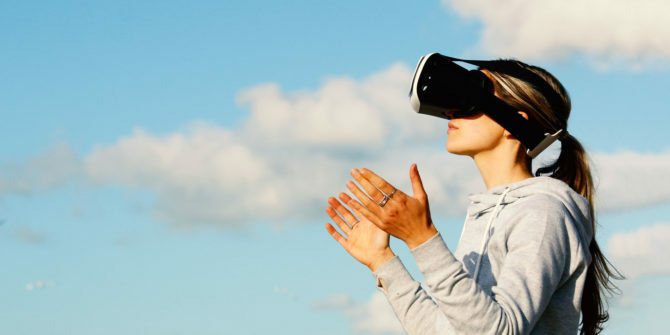 Existing vertical market specialists in traditionally non-VR markets will find opportunities to exploit these enabling technologies by adding their knowledge of customer needs and applications, thus drawing VR technology into new market areas. More innovation will occur, primarily at the points of greatest opportunity where the elements of the value chain can be done better, with higher quality, or more efficiently. Such opportunities may occur where a pioneer firm had to improvise a solution outside of its sphere of expertise in order to deliver application solutions. In this manner, the original innovators will be driven back to their own turf unless they continue to innovate. What are today’s enabling technologies? The DataGlove, Silicon Graphics, Polhemus, various database engines and communications networks, etc. What are the opportunities? Innovation in display systems, man-machine interface hardware/software, VR software engines, tactile systems, audio systems, VR clip art, environment authoring systems, and many others. Who are the vertical market specialists? Anyone who has customer needs in an area which may profitably be served by virtual reality and has the ability to integrate, apply, or specify existing or future enabling technologies. The firms that will make money are those which find creative ways to apply VR to existing customer needs or find ways of creating new needs which require VR. For the reader with an interest in making his/her mark on the world through the application of virtual reality, I heartily urge you to consider the concepts presented here. VR will be just another passing fad unless it finds acceptance in the commercial world. In order to do its proponents must be active participants in that world. While virtual reality may change “Real Reality,” it will do so as an insider – not as an island. And besides, it’s lots more fun to invent products that everyone wants.